CHAPTER 9: “THAT’S OIL, FOLKS!” -- Ken Webster begins a series of detailed reports on Aramco departments, camp life, the Muslim faith and more; the Crown Prince and his entourage visit for a month; Ken travels to the Empty Quarter and the King’s farms; Aramco rolls out the “Applied Leadership Series 1950 Training Program” to promote better understanding between management and employees; currency switches from U.S. dollars to Saudi Riyals. 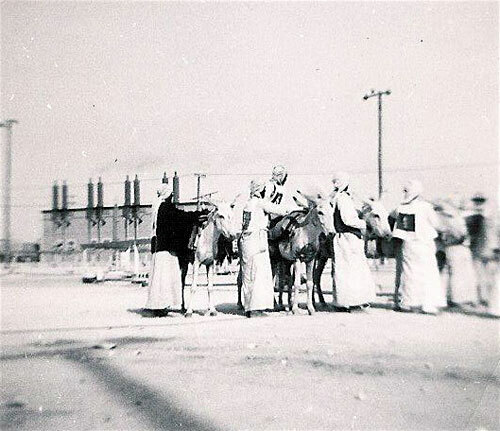 As Acting Manager of Aramco’s Transportation Department, Ken Webster embarks on many travels throughout Saudi Arabia in 1950 and describes them in detail to the folks back home in the States. From observations on the new Dammam deepwater port (a project to which his brother, Allyn, an assistant engineer, is assigned) to interesting descriptions of visits with Aramco exploration teams in the Empty Quarter, to tours of the King’s farms, to “lessons” in Muslim law and religious ceremonies, his fascination with and respect for the Arabs and Aramco shine through in every word. He is very obviously a man in love with his work. 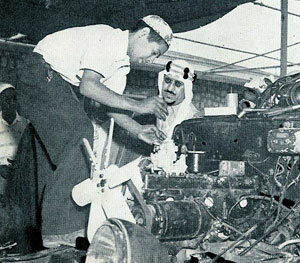 Given his restless nature, he somehow also finds time for extensive yard work, family activities and enormous amounts of entertaining – all part of an Aramco executive’s daily life in the Dhahran of the 1950s. This chapter covers January to August 1950. 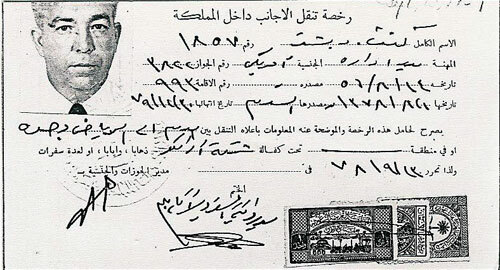 Ken Webster’s company ID card – in Arabic, early 1950s. Friday the thirteenth and all is well in Arabia. Went to Ras Tanura Tuesday night to a meeting of all the managers, and five miles out from here a severe windstorm struck, and the sand in the air looked like a Montana ground blizzard. It was a forty to fifty mile [per hour] wind for a short time, and then strong winds all night. Turned some of our boats, barges, launches, etc., upside down and did damage that will cost about $150,000 for salvage and repairs. We have three 1,000 [horsepower] tugs called Abqaiq 1, 2 and 3 that are 105’X30’X14’6”, with a draft of 12’05”. They cost nearly $300,000 each and are equipped with firefighting apparatus. Steam engines are the prime movers, but diesel would be better. They are used as necessary to moor and unmoor tankers and freighters at Ras Tanura piers, and to make tows of barges from ship to shore and up and down the Persian Gulf. Then we have six tugs, 250 and 350 [horsepower] . . . costing $36-$77,000 [each] for towing barges from ship to shore, Saudi Arabia to Bahrain, Ras Tanura to Al Khobar, and for moving off shore drilling and exploration craft coastwise. These are all diesel. There are seven smaller tugs, 120 to 160 [horsepower] for service as above. Passenger launches to transport eight to 65 people range from 37’ to 107’ and from 165 to 1300 [horsepower]. We transport Arabs, Americans, Italians, Indians, etc., in generally separate boats, to and from Bahrain offshore work, ship and shore, etc. They are almost all diesel but a few are still gasoline. In all there are 45 powered craft, including two sea mules, to terrapins, fishing boats, etc. There are twenty-six sea worthy barges, 13 wood and 13 steel . . . One of the above is 126’X49’X12’ derrick barge, capable of handling heavy lifts from ships up to 100 tons, and is used mainly for small boat repair. These craft are insufficient for our needs, and therefore we hire tugs and barges as necessary. Most of the activity is at Ras Tanura or between there and Al Khobar, which . . . is the port for Dhahran. Soon the new Dammam port will be in operation, and business will fall off as the new railroad will be used [whenever] possible. Radio contact between all piers and marine activity helps greatly. Over 100 tankers per month and eight to fifteen freighters call at our ports, and it is big business. We have two deepwater piers at Ras Tanura, a sea island at Ras Misha’ab, a shallow pier for barges only at Ras Tanura and Al Khobar, and as mentioned, will soon have another deepwater pier at Dammam halfway between Ras Tanura and Al Khobar. Our large craft repairs are to date made at Basrah, several hundred miles away, but we have ordered a dry dock to handle all our craft, and will do the repairs ourselves in the future. [The] total [number of] 42-gallon barrels of oil shipped last month was 9,952,131, which is not a record, but high. Total tonnage handled of dry cargo nature, 16,202. We have had as much as 31,000 tons enter Arabia in a single month when construction was at a peak. . . 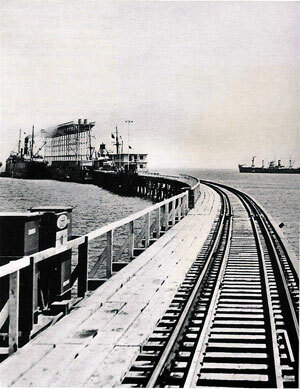 The Dammam deepwater pier that opened in 1950. Took the family to Hobby Farm for an hour, while Allyn and I inspected progress on the new Dammam Port. The earth fill is almost complete and soon after next weekend, they expect to start laying railroad track on it. There are still 150 thirty-foot bents to drive on the trestle, which is going slowly, due to weather, and as the main pile driver sank in a storm last week. It hasn’t yet been salvaged, due to rough water, but hope to float it in next few days. Allyn is working on this project and needs all the clothes he has to keep warm. Temperature dropped to 42 several days ago, and is in high forties or low fifties every night. That is quite cold here, but won’t last long. All of us in Arabia are very happy to hear that Ed’s operation was successful. (Editor’s note: Ed Webster, Ken’s other brother, in Connecticut. He had back surgery to repair a vertebrae problem.) With all the value we put on worldly things, good health is worth all the rest. We have colds and such here now and again, but generally speaking, we are lucky so far in having good health. Someday I hope they make some substance that will really give relief to hay fever and allergies. Maybe we can all retire to Arizona, where there are no winds, it is always the temperature you want, and my seafood can be flown in daily. When I am president of Aramco, I intend to put into effect a new policy. Employees will only be required to work until they are thirty. They will be retired at full pay for twenty years. At age fifty, they will be required to return to work for their remaining working years as health and desire permits. There will be no 65 retiring age, everyone will have seen the world and enjoyed themselves at an age when they could best do so, and industry as a whole will benefit by having happier employees who never face the future with regret or insecurity. So far, this plan has met with approval of all but the Board of Directors, who may not yet have been contacted. Both the girls are at the afternoon show, Mildred is frying chicken, at five we go to the [Alex] MacKenzies for tea, then home to chicken dinner. The garden looks good, but isn’t growing very fast. The lawns and shrubs, though green, are more or less dormant, apparently. . .but the first spell of warm weather should give all a spurt. The tomato plants are lagging the most, but some people who planted their gardens a month earlier than we did, have tomatoes not yet ripe but looking very promising. Today is Susan’s birthday and we shall have a cake with nine candles on it for dinner tonight. That will be a surprise for her, as she doesn’t expect anymore birthday activity, [since] we had a party for her yesterday. 21 boys and girls from her room at school came to the house at ten thirty, opened the presents, played games, I told them some stories, then at a little after eleven I had a large bus take us all for a drive around camp and then to the eleven-thirty movie. After the show, Mildred and I took them to the Fiesta Room of the family club, and fed them hamburgers, cookies and milkshakes. All in all, I think she had a good birthday. Mildred and I gave her a new wristwatch, and from the others she received candy, five dollars, games, etc. The knitting bag and skirt Gram made for her [were] not given at Christmas Time, but held for the birthday, and pleased her very much. . . The Crown Prince, Amir Sa’ud ibn ‘Abdul ‘Aziz ibn ‘Abdul Rahman Al Faisal, arrived for a month’s visit. He was accompanied by some 100 of his people, including fifteen sons whose ages are 19, 18, 16, 15, 10, four at 8, two at 7, three at 6, and one 5. Also a grandson by a daughter, age 9. The children’s tutors were brought with them so that they would not get behind in school. Three to four thousand met him at the airport and a reception was given in his honor. Then that night a dinner was given for him at Dammam, the center of government in this area. 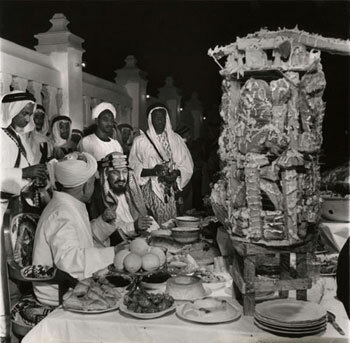 The next night, Aramco gave a dinner for him at the Dhahran Dining Hall, for about 450 guests. [We] opened up a new Machine shop in the desert town of Abqaiq this past week. It is 195 feet long by 90 feet wide. Being too large to air condition economically, the air is changed and filtered frequently by keeping a few ounces of pressure in it -- the dust and sand are . . . kept out. This building contains the latest equipment of any shop east of New York, and combines Machine shop, Electric shop, Instrument shop, Sheet Metal shop, Welding shop, Plumbing shop, and one for the Pipefitters, as well as a Central Tool Room. At the same location, we opened a new garage and will place it in service this week. It will be able to service the Abqaiq Motor Fleet of 275 light cars and pickups, and 155 heavy trucks and buses. Speaking of buses, here’s one: The Abqaiq bus stopped with a jerk --and he got off. Latest movie here is “When My Baby Smiles At Me,” with Betty Grable. The kids saw it and liked it. We are getting better movies all the time now, and when our new 600-seat theater opens in about four months, Mildred and I probably will go more often. I went twice in the past two years. The girls just walked into the room dressed in two of my suits and pillows stuffed in the front. They sure are a laugh, looking like gnomes. They both delight in dressing up in costumes and entertaining us or company, and are surprisingly original at times. We are trying to get Machmoud a new passport, and the information furnished the Khartoum office reads like this: "Tribe--Dunguluayi; Gov't representative--Ahmed Taan al Malik Dungula; born Dungula about 1928; Father—Mursi abu Bakur; Mother—Layla Bint Haag; hair black, complexion black, eyes brown, facial tribal scars. There are no vital statistic records in this part of the world, but instead info is passed down by word of mouth. No special news, but will recite the week’s events. Lowest weather temperature 46, highest 68. Lowest all winter so far 36 and that is cold here, as it is in windy New York, Chicago or in Port Arthur [Texas]. Today was warm and we went to the Hobby Farm so Susan and Judy could ride horses for an hour or so. There is a lot of pressure being brought to bear on me to buy a horse, but so far I have been able to hold off. . . The population figures released this week show Americans at 2,955, plus 652 wives and 519 children. Approximately 258 children are in school here, 20 are in Beirut, India, Switzerland, etc., and the rest are below school age. No births this week, but several are due any minute. I am getting some reports together to list the quantities of food consumed here by Americans and others and will have the figures next week. They are interesting to those who never think of them when they only have to call the corner store and get what they need, but we have to plan at least six months ahead in order that we don’t go hungry. I still don’t have the Exploration Dept. info or drilling list to quote, but will give it in subsequent letters as a brief outline of what we are doing in an area larger than Texas and California combined. To work properly in this area, we travel over much more territory, as Saudi Arabia is much larger than most people think. We who are so used to taking a train to anywhere in the States, and having taxis to take us from station to house, can’t understand a place like this where we have to provide all transportation. Our new railroad is half serving Aramco now, and by September 1951 will be all the way to the King’s Palace, and therefore will take much of the truck cargos now required. When the new Dammam Port is completed in April, many trucks now needed will be available for other work. This country is being developed fast, and the railroad will be a main implement as it was in opening up the U.S. Our fleet of 2,500 vehicles, cars, truck and trailers does a really big business now. Portable service stations, portable garages, etc., are part of our business at locations up to 900 miles from the main town or camp. Last night we had 20 in for dinner and a party, for my birthday and Louise Clausen’s. I received Indian ashtrays from the girls, cigarettes from Ally, phizz bombs from Lynn, and a new Remington Shaver from Mildred. It was a very nice birthday for me . 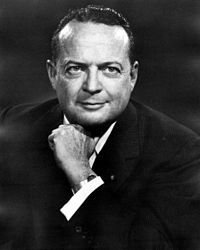 . . We sang to Bob Underwood’s piano playing, danced to radio, and had a big evening. 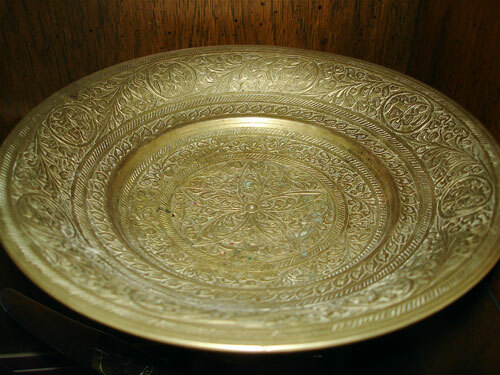 One of the etched brass Indian ashtrays given to Ken Webster by his daughters, 1950. Photo by Ken Slavin, from his mother’s collection of family items. The big event this week will be the Women’s Club tea for the Crown Prince, tomorrow. Lynn will be one of the tea pourers and about 500 women, including stenos and nurses, will attend. Will report in detail next week. The visit of the Prince hasn’t bothered me too much, although we had to provide about 25 cars for the party, even though they bought or rented some 25 to 40 cars from local dealers. A few nights ago my new assistant from New York office [Alex MacKenzie] called to ask for help in finding his 7-year-old son, who hadn’t been seen since 5 P.M., and it was then after eight. I called Identification and drove around camp, checked all the Arab tents, etc., and found the boy with a friend in the movie. It doesn’t happen often, but boys are boys no matter where it is in the world. They had ridden the Prince’s horses, visited the soldiers’ tents, and then gone to the show. . . Still no second birth this year, but from the looks of the laying in house across King’s Road from us, there will be plenty soon. The average last year was four per month, and here we are with only one so far in 1950. With a Winchell nose to the ground (Editor’s note: humorous reference to the famous American gossip columnist, Walter Winchell, of the now-defunct New York Evening Graphic), I can assure you the average for 1949 will be beaten. If this cold weather continues, we should have lots of happy events before October. As you remember, it took 40-below weather [in Montana] to make a Benedict of me, and we lost no time after that. . .
School enrollment in Dhahran has gone up to 156 and each plane brings new children with families to swell the ranks. . . We have ample teachers now, and from all I read in the papers, have more teachers per child here than in the States. We think our children get better individual attention than I ever had or that is expected in the average school at home today. Judy has always been good, being a whole lot like her Aunt Alice was. Susan is better all the time and really takes an interest in her work. Both are well liked by the teachers and other children, and I am reviewing many subjects about which I am quite rusty. Our Encyclopedia Britannica comes in very handy, and both Mildred and I gain knowledge from looking up subjects with the girls. View of Hobby Farm, early 1950s. Just came back from the Hobby Farm where the girls rode horses for one and a half hours and Mildred held her breath. It is a fine day with very little wind. The Crown Prince is still here, but leaves in two days. I think the best entertainment for him was the magician, one of our telephone men, who had all the Royal Party completely confused. One observer said, if he appeared to draw money from the nose of one of them, he would probably go to his tent and blow his brains out to get the rest of the silver coins! Had a dinner for him in the Dining Hall here, about 365 Americans and 50 Arabs. The menu consisted of: stuffed tomatoes with chicken salad, French fried shrimp, tartar sauce, roast tom turkey with dressing and giblet sauce, cranberry jelly, roast loin of beef au jus, roast leg of lamb with wild rice, buttered beets, peas, roast potatoes, relish tray, dinner rolls and butter, assorted preserves and fruit, egg custard, cookies, nuts, Napoleon cake, coffee, tea, milk. I filled up on the shrimp and almost burst, and was so sleepy I went to bed at nine o’clock. 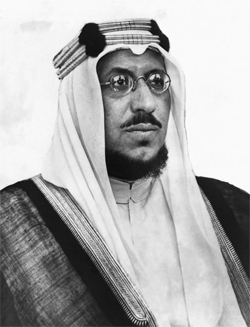 Crown Prince Saud, circa early 1950s. Sent eight more Arabs to New York for one year, to train new American recruits at the Long Island Training Center. It is wonderful for the boys who get to go, and the things they tell about when they get back is all part of the change taking place in this country as the American influence is expanded. The Dhahran Women’s Club had a tea for His Royal Highness and Lynn was one of the four tea pourers. Nearly 500 women attended and shook the hand that rules Arabia. Bob and Gladys Underwood left Wednesday for home leave. They took a British India boat from Bahrain to Basrah, then will visit Baghdad, Damascus, etc., before taking the same boat we did from Beirut, arriving in New York about March 17th. The second foreign bank opened here this week – The British Bank of Iran. The first one was the Indochine Bank. Four babies [were] born this week, three boys and one girl. The pregnant women are practically standing in line for the delivery room and the monthly average is bound to take a big rise soon. The girls are at the 3:15 show, “Street With No Name,” and Mildred is frying chicken. I doubt that I shall last until dinner time . . .
Allyn and Lynn went over to Bahrain [yesterday] on a shopping tour, [but] had to stay overnight [because] a forty-mile wind came up and the boat didn’t come back until today. I had promised to tell a brief story about drilling here, so [I] will do so. Hopefully, no remarks will get into print, as I would be subject to criticism. Most of the information in general is in magazines, but details are lacking. Map of Saudi Arabia, circa 1950. You all must remember that Saudi Arabia is about 1,200 miles wide and 1,400 miles long, covering over 1,000,000 square miles. For those who think there is no place larger than Texas, let me say here that our concession for drilling exceeds the states of Texas and California combined, in area. At first we drilled at Dhahran, into what is called the Dammam Dome. The first well was brought in [successful] in early 1941, and is still producing. We do not drill in this field any longer, have 30 producers, one sweet gas, two shutin, and eight abandoned. About 90,000 [barrels] monthly is produced, although more could be if needed. Abqaiq is 40 miles southwest of Dhahran, has 44 producers, one drilling, 13 completed and awaiting connection to oil gathering systems, and three are used for observation of water rise, pressure, etc. Twenty-five miles south of Abqaiq is Ain Dar, with 7 completed but not yet connected, and one is drilling. 95 miles south of Ain Dar is Hardth, where four are completed waiting for connection. Twenty miles north of Dhahran Is Qatif. The field has 4 producers, one abandoned, one shutin, three completed awaiting connection, and one drilling. We are continuously north, east, south and west in all fields to learn extent of the reservoir. Quite possibly this is all one field, and extends north to and through the Kuwait and Abadan fields. Total production still exceeds 500,000 barrels per day, which is a lot of oil in any language. . .
Wells are drilled through sand and rock, almost entirely by rotary drills. Most wells last year took 38 days, but some isolated locations take over 100. Men live in the desert and work 24 days, then come to town for four days. In addition to oil wells, we are drilling five to ten water wells all the time, either for the Government to serve the oil well drilling, or for Trans-Arabian Pipe Line Construction amps and pump stations from here to the Mediterranean. . .
That is a brief picture of the drilling group. Map of the Hasa province in eastern Saudi Arabia, circa 1950. From Ken Slavin’s collection of Webster family papers. Today ye Editor will take you on a trip south to the Rub al Khali or Empty Quarter. Six of us left Dhahran a little after seven A.M. in a C-47 and flew southwest for an hour and a half to a point over Al Kharj, the farm run by Aramco for his Majesty. 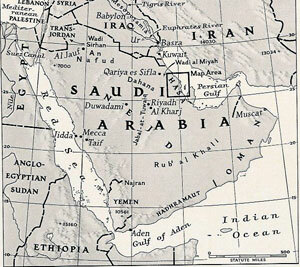 It is about sixty miles east of Riyadh, the so-called capital of the Kingdom. Then south on the west side of the Tuwaiq Mountains. These mountains are over 5,000 feet elevation, have a limestone cap, and the rest appears to be gravel. . . a very rugged appearance. It would have been impossible to take off again, were we forced to land there. On both sides were open desert stretches, drifting sands, and little vegetation . . . On south we flew, for a total trip of almost 600 miles. We arrived at the most southerly base camp at eleven thirty. This camp is composed of two Americans, nine Arab drivers, cooks, houseboys and mechanics, and thirteen Arab soldiers. The soldiers are for protection, as this part of Arabia has not been traveled by many foreigners and the wild tribes are unpredictable. These two Americans leave here in September, return for two weeks at Christmas, and then stay out until July. They make contact daily by radio, are taken food, gasoline, etc., once to twice a month, and the rest of their time are on their own. They use the camp as a base or SPIKE point, and spike out for one to ten days in all directions with minimum equipment. Their work is to follow and measure formations, outcroppings, etc., and interpretations of these tells the story of subsurface materials, probability of oil, etc. 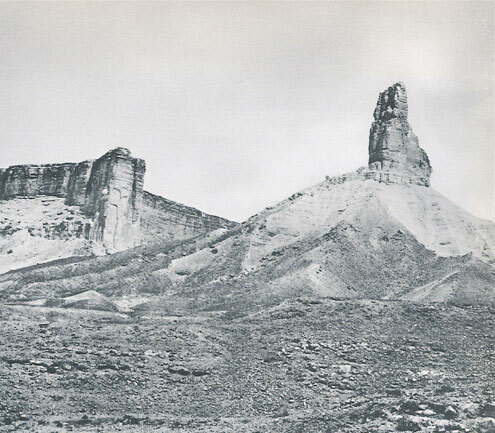 The Tuwaiq Mountains, west of Riyadh, 1950s. Most of this area is completely unexplored and reputed to contain ruins of settlements of ancient times. We drove twenty miles south of camp and came to an apparently abandoned city . . . the size of Dhahran, covering some 320 acres. Some walls were still standing, many foundations were visible, acres of broken pottery, many grain mortars of solid stone, pieces of alabaster, etc. I brought back one stone about six inches square that appears to have Himyarite writing on it. The Himyarites were supposed to have come into prominence about 115 B.C. and recently someone has interpreted writings found in Northern Arabia. After I take a picture of this stone, I shall give it to the group who follow up on such matters. We are not allowed to keep them. 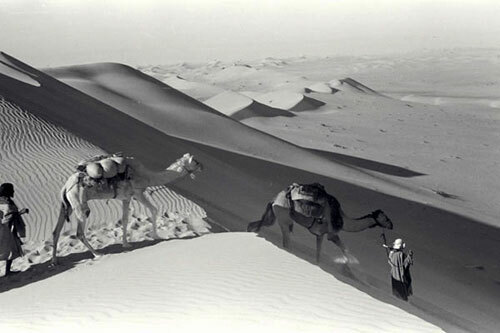 View of Empty Quarter, 1940s. Photograph courtesy the Internet; photographer unknown. We took pictures of another stone about two feet square that had inscriptions similar to Greek or Egyptians and which probably are Phoenician. This city was located in a valley surrounded by two hundred-foot-high stone rim rocks, and on many of the walls were writings, carvings, etc. One was of a man about my height with a stone arrow or spear through him. One coin found there last year was said to be one from 200 A.D., according to the Chase National Bank in New York. As we stamped our feet on the ground, it sounded like a hollow drum, and maybe [it] is a buried city. This location is a hundred miles below the Tropic of Cancer, and only a few hundred miles from the Yemen. It is on the “Oregon Trail of Arabia”, as it has an important water hole still being used, but no one is allowed to excavate to find out more about it. Then we had lunch of canned chili, tea and coffee, homemade bread, canned peaches and cheese. These boys have no ice, fresh vegetables or meat, except the gazelle and Arabian pheasant they kill. You have to be really interested in your work to spend the year in these camps. We came up the East side of the Tuwaiq Mountains, which area is [entirely composed] of moving sand dunes. . . It was only a 1,200-mile trip, but showed me new country and how some of our people have to live. Several days later I went to a luncheon for visitors from another oil company up north. The head man was Sir John Cunningham, former head Admiral of the British Navy. It was very unusual for us, a cocktail party from noon to one, then a steak dinner for lunch from one to two thirty. Drinking and eating heartily in the middle of the day is not normal for us, but might be gotten used to if necessary. . .
Had a long rain before we awoke this morning, which was very unexpected, but welcome for the lawns and garden. Our tomatoes don’t look too good, but may make it yet. Pulled some carrots today and was surprised to find them six to seven inches long with very small tops. The beets are almost ready, had cauliflower once and more coming nicely, and the cabbages are heading up. The bronze lettuce stays plentiful and is enjoyed mainly by me, but sometimes by the girls . . . 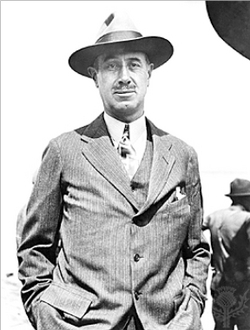 The outstanding event of the week was one of our vice presidents, Floyd W. Oligher, receiving EXCEPTIONAL CIVILIAN SERVICE AWARD from the U.S. Air Force for promoting the USA interests in aviation and through his long friendship with His Majesty King Ibn Sa’ud materially made possible the establishing here of the Dhahran Air Base by the USA. This base vitally linked the two theaters of [World War II], and made possible the first non-stop ‘round the world flight. Not many of these have been awarded and we are very proud of Floyd for his work and being one to be so recognized. After dinners at the Air Base, speechmaking in our office when the award was announced, our senior vice president held a cocktail party at the Executive House for Floyd last night. We went and had a fine time, then after dinner, watched Judy and her group square dance for an hour or so. This is now a weekly event for the teenagers, and is sponsored by several families and led by some of the mothers. Today we went to the Air Base at one P.M. for the wedding of one of our stenos and a Captain of the base. After a fine reception, the groom took his bride on a honeymoon to Teheran in Iran, flying her there in one of the Air Rescue planes, specially equipped with a thirty-foot boat which can be launched from 400 foot elevation and slowly dropped to the water with two sixty-foot parachutes. He flew the plane and it was [a] very romantic setting to see them take off into the sun. . . 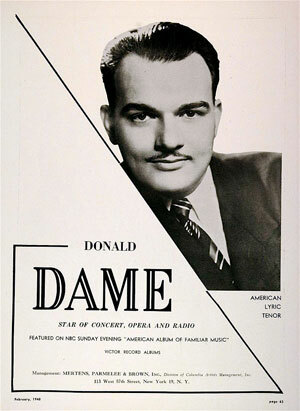 Went to a show this afternoon, saw “Pale Face” with Jane Russell and Bob Hope. A very zany picture, but I had many a laugh from it. This makes three times in five months. If I don’t look out, I’ll get to be a regular theatergoer. I have the wanderlust, and would like to be planning a vacation. Maybe we shall take our local leave in August when the girls don’t go to school. [We] are checking now to see what trip is best for our pocketbooks, climate for Mildred and the girls, and the most interesting for all to remember. Five months already gone by on this tour and the mid point will be here before we know it. plane – a converted B-17. Uncredited photo from the Internet. The first ship berthed at our new oil pier at Ras Tanura this past week, and it was the “Kentucky” one of the Texas Company super tankers with capacity of 240,000 barrels. If all goes well, we shall see a movie today, “Spring in Park Lane,” one of the best British films of 1949. Recitation: Spring is sprung – the grass is riz – I wonder where the birdies is. Two boys born this week, one 9 pounds 11 ounces and one 6 pounds 14 ounces. Lynn’s birthday today, so we went to Al Khobar shopping this morning and bought her some brass and a headdress called Gutra. Will see her and Allyn a little later before or after the show. Did I tell you about my gift from the Crown Prince during his present visit? It is a dagger about seven inches long, steel blade with gold filigree hilt, and the scabbard is eleven inches long and covered with gold leaf and filigree. It is worn at the waist, is “L” shaped, and a wicked looking thing – but ornamental. The King’s guards still wear them. It will be something to remember this place by. Went to Hobby Farm at one, but no horse owners were there, so couldn’t ride. Fed Susan’s former dog “Buttons,” the girls slid down some sand dunes just like we used to slide down snowdrifts at home, then we came home and will go to movies in about 45 minutes. I am not keeping up with my series on Saudi Arabia [Aramco] groups but should have some information on the remaining departments soon. I have been busier than usual with visitors and meetings and couldn’t prepare for these weekly fireside chats like I want to. St. Patrick’s Day and raining, and as it is Sunday and day of rest, we shall not see many people and therefore will not know if they are wearing the Green or Orange in camp. The children are still at Sunday School and Mildred has walked over to meet them with umbrella and capes. Wednesday night [we] went to a cocktail party at Executive House for Colonel McCormick (publisher of Chicago Tribune) and wife. He is an impressive old man, and obviously a man of his own convictions. After dinner, Mildred and Judy, with Lynn and Allyn, went to a concert by Professor Julian Hertz, pianist, from Damascus. The local chapters of Aramco Employee Association arranged for his visit by plane some 1,100 miles away. All who were there spoke very well of his performance. I stayed home with Susan, as I had been on a trip south all day and was tired, and am not a concert fan anyway. The trip south was to two desert camps, one a gravity meter and one a double structure drill. . . We left [to come home] at three thirty, taking fifteen Arabs back for days off. 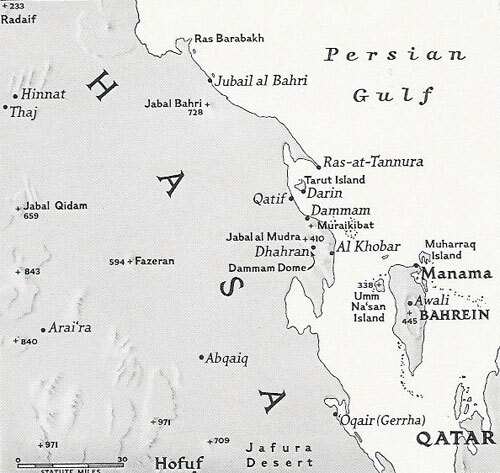 We usually stop at Hofuf, the capital of…the Al Hasa Province, going and coming, but this time all the Arabs were coming here and we flew straight to Dhahran, almost 300 miles. The Arabs were as glad to be getting back to the “flesh pots” of civilization as the Americans, after 42 days, and chattered like monkeys all the way. Enroute, we flew over a new oil field in the Shaikdom of Qatar (pronounced ‘gutter’) being explored by Iraq Petroleum Co. It is a very barren peninsula, and we counted ten wells operating. There are about 13 Americans, 70 to 80 Europeans, and probably 300 Arabs. It was a pretty picture from the air, but seemed to us even more desolate than here. Arrived Dhahran 5:20 and drove to office first. One American said, “Gee, look at that lawn, we didn’t have that when I was in camp before.” They are always hungry for green lawns, gardens, trees, etc., and after five and a half years here, I know what they mean. . .
We have a program on to have every manager tell all employees what he does, how his department works and why, and in general to improve operations by removing the mystery of Big Business. I take my turn in November, and to give you an idea of what it means, I quote the first manager’s talk: “Conducted 75 meetings, spoke to 1640 employees, talked 112 hours, answered 1556 questions, traveled 180 miles between camps.” The program is four talks a day for six days a week, for three consecutive weeks. Very informative, but who does your work while you are gone? the Aramco camps with U.S.
At the first Boy Scout Court of Honor last Saturday, numerous boys received with their merit badges a letter from the Governor of the state from which they came here. . . This morning we awoke late for us, and after yard work, walked over to see Scotty and the baby. While there, a neighbor from next door was having his hair cut. The Indian barber comes to his house every Fridays, as this man claims he doesn’t find time to go the barbershop. I had tried to get mine cut several times this week, but always there were too many people ahead of me and I wouldn’t wait. So in turn, four of us had our hair cut in a canvas lawn chair out in the front yard. Many passersby laughed about it and pictures were taken. Because the barber came to the house, he charged double, so we paid 60 cents apiece. How will I ever get used to a dollar or more haircut after so many years here at 30 cents? We get good ones, too. 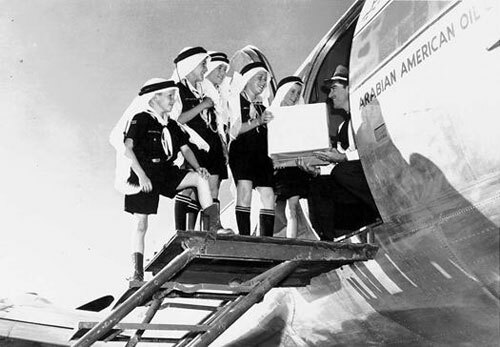 . .
Aramco Boy Scouts receiving a package from one of the company planes, circa early 1950s. Photographer unknown, from Ken Slavin’s personal collection of Aramco memorabilia. High of 85 and low of 56 this past week and no babies. Lots of wind and sand-laden breezes and starting to blow now at one P.M.
Forgot to set clocks ahead one hour at midnight last night, so the girls missed almost all of Sunday School today. . .
Did you know that the true Arab Time is daily sun time, and therefore you have to set your watch every day in order to be on time? In about another month, we shall set our time ahead one more hour for the summer, which will take care of the Ramadan period of fasting and utilize maximum daylight. In the future, we expect to change clocks twice a year, just before April First and just after Sept. 15th. This will eliminate trouble by not interfering with Arab prayer time, eating times and work schedule. You can see from all I write that we govern all activities to the best interests of the Arab. …Girl Scout Investiture at eight, where Judy will take part in making a group of young scouts full members, Susan being one of the young ones. Went to a party last Saturday night for three 30-year service men. There are twenty men in Arabia with more than 30 years’ service, and one is in his 38th year. In another eleven years and three months, I’ll have a thirty-year party here, if I am here then, although such is not expected by me or my local family. Judy wants to stay here always, Susan wants to go home and live on a ranch, Mildred wants to live where there is no wind nor heat but not in a city, and I want to live near clams, crabs and lobsters and make wadjid floose and be not more than one mile from my work. Maybe we’ll come home in 1951 and stay until the girls are grown and married, and then return here for the closing years of our work period. Of all the environmental diseases that have caused trouble here, the worst has been LOCATIONAL PSYCHONEUROSIS, which has been cured only by the person’s going home to their family. Now that we are all together, and Lynn is here, there is none of this disease in our Arabian Websters. . .
It’s my fault these letters weren’t mailed on time, but didn’t get around to my part of them. We came up to Ras Tanura yesterday and plan to stay until Saturday. Ken is “doing” the Marine Dept. – and would have had to drive back and forth for several days. It’s school vacation, so we are having a little time at the beach. We have a house and are only [cooking] for breakfast and lunch – eat dinner out. The beach is wonderful now and warm in the middle of the day and cool at night. The Scout uniforms arrived and are fine – thanks so much. They were in a trunk up in Customs the last 6 weeks – some sort of snafu. Didn’t write last Friday, as was in Ras Tanura and no typewriter handy. Actually, left here a week ago last Monday for Ras Tanura to spend a few days to a week while I reviewed all Marine activities and all of us had a change of scenery. The beach was wonderful, but could have been a little hotter. The water temp is in high 60s, so no one went swimming but me -- and Susan once waist deep. Took Biedlebalm (our tiger cat) with us, probably the only cat to ever take a local leave at the beach in Arabia. [Bill] Cooper came back from a business trip to New York . . . Carl Renfer is arriving here with his family by July or early August. Don Wasson wouldn’t even talk to Cooper about coming here. A new airline, KLM, now stops here regularly enroute [to] the Orient from Europe and USA. This [is] in addition to Pan Am Charter, TWA two to three per week, Middle East Airlines twice a week to Beirut, Saudi Air Lines and our own regular flights to Beirut and USA. The airport of Dhahran is on all maps for air, postal, etc., and becoming known as a very important link in world travel systems. Latest listing of personnel here shows 2,193 Aramco plus 622 Contractor Americans, 697 wives, 557 children. Italians 900, Arabs and others 12,000, plus Arab contractor men 4,800. This is becoming more and more an international group, as many of the boys marry girls enroute home or on local vacation in Germany, Italy, Lebanon, Cairo, France, Ceylon, South Africa, England, Switzerland, Sweden, etc. Within two years there will be representation from almost every country living in our camps. [For local leave] I still like the idea of going north to Beirut, Jerusalem, Damascus, maybe [the] Island of Cyprus, etc., and air travel is free. Also to Eritrea is free. We have so many choices it is hard to make up our minds, but we don’t have to for another six months or so. It was such a nice day last Friday, that I worked in the yard for the first half, then took the family and Allyn and Lynn to the beach. As a result, I did not find time to write the usual weekly letter, but will bring you up to date with this one. . . Temperature hit 100 for first time this summer, and a low of 72 this week made all of us glad we have air conditioning. It really isn’t too bad, as you can get a good night’s sleep, but walking any distance in the middle of the day is not liked by the ladies, even with a parasol. Last Tuesday night I went to Abqaiq to give initial address to all managers, and tomorrow start the four-a- day, five days a week, for four weeks, Chautauqua, addressing all American employees, to tell them what my department does, and what I am responsible to management for in all phases. I will talk for 20 to 30 minutes, then answer questions for an hour or so. It may get quite monotonous for me, but will be a good thing for all others. Each department head is doing this (nineteen of us) and we feel a better understanding will be had by employees of the company and its objectives. It is called Applied Leadership Series 1950 Training Program. In one address last week, I heard this interesting item. In all oil industry, the average successful well-to-dry-hole ratio is one good one in twenty tries. One in ten is considered exceptional. Aramco in Arabia has a fifteen-year record of seven out of each ten drilled, being definitely successful. Starting May First we stopped using dollars in camp and are now using only Saudi Arabia Riyals, half riyals, and quarter riyals. Food and canteen items were re-priced to permit this, and we have to get acquainted again with the value of a riyal. The company-pegged price is 30 cents, but the bank and market price is from about nineteen cents if you buy merchandise to about 22 cents if you buy money with your dollars. Dollars when bought by merchants needing them for payment of USA bills cost one and a half to three cents more than Americans get when they sell dollars. This is the bank side of the deal. Sometimes cashing a dollar check costs three quarters of one percent of the face value. If the merchants want dollars badly, they pay more. It fluctuates almost daily for a while, then stays the same for a while. I used to get $128 living allowance per month, and paid $83 for rent and utilities, leaving $45 for food subsidy. Now I get $350 monthly living allowance and pay rent $200, lights, gas and water $14, air conditioning $37, furniture rental $27, which leaves me $72 subsidy on swimming pool, food, movies, etc. Allyn and Lynn do better, as they have a much smaller housing unit in the apartment than we do in the three-bedroom house. We won’t know for a few months, but we can expect to live a little cheaper than before as soon as we begin to buy almost all foods, etc., from soft currency countries. Most meats, vegetables and fruits we think will come from New Zealand and Australia, wines and cheeses from Italy, etc. Both Bill Dunbar and Bob Norloff (Editor’s note: presumably Aramco managers from the New York office) had dinner with us this past week, their second day in on this trip. They get here about every 25 days now. . . it is handy having Bob so near Sister so that rush things can get to us with least delay and inconvenience to the home folks. He brought the lens for Susan’s glasses and the candy – thanks Sister and Gram for the trouble. I didn’t know how to put the lens in the frames, but one of my men did, which was just heating them in hot water. Just came back from a visit to the nearest village, Al Khobar, seven and a half miles away. Took Daisy Cooper and two women who arrived this week without summer clothes. They wanted to buy cloth to make some hot weather dresses before they receive their personal effects, due but not sure to arrive for some time. No sun, rather overcast, rather unusual for here, and due to sand storm somewhere and the dust settles down on here without wind. It appears to be clearing now, but still no sun. While in the village, which has grown a lot since we arrived four years ago, we saw many new signs, one said, “Her, grees, flat tayers.” (Editor’s note: Presumably, “Here – grease, fix flat tires.”) It is the newest garage and one of nine. Visited one tailor shop, “Civil and military clothes” which had many American and English items, especially good woolens, camel’s hair, etc. These Indian tailors can copy a dress or suit that fits you, but can’t take measurements and make anything satisfactory to Americans, either men or women. Saw many American-made toilet articles in the shops and the prices not too high. 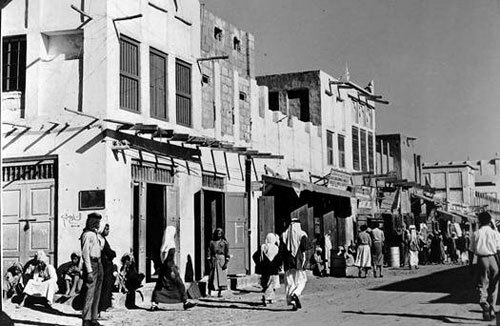 View of King Saud Street, Al-Khobar, 1950s. Now that we carry riyals instead of dollars, shopping requires more planning, as the silver riyals are on the heavy side. Each one weighs about the same as a 50-cent piece, about 30 pounds to the thousand. ($220.) Therefore, $22 weighs about three pounds and it gets heavier the longer you carry it. It is a common sight now to see all women carry a little cloth or leather sack, with their riyals, half riyals and quarters, and jokingly all are advised to care one in each hand to not distort themselves physically, especially children growing up . . . When rugs are bought for $1,000, or cars for up to $3,000, it takes a car or truck to carry the coins. I have a riyal account in the local Indo Chine Bank, and can write riyal checks as necessary. To date, there is no charge for the bank account. 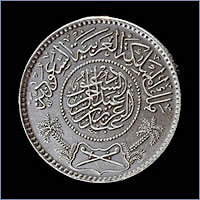 Saudi Riyal, silver, circa 1940s. Yesterday the Girl Scouts went on an overnight camping trip to Half Moon Bay, about twenty miles from here. Our two [Judy and Susan] went along with thirty-five others and five or six grownups. We sent them in a 60-passenger personnel carrier with two Arabs, a four-wheel drive Dodge pickup, and ahead of them went the firewood, water, tents, etc. It took all week to get them ready, almost as much effort as if it was for the summer. I had steel grills made for them to cook on, borrowed a mess kit from the airbase, obtained canvas for a bedroll, made up two first-aid kits [the girls helped], packaged the food for four meals, borrowed water jugs and flashlights and pocket knives, added a change of clothing, bathing suit, sunburn tonic, toilet articles, sheets, pillow, blanket, etc. and when they left they looked like gypsies off for a trip. Had word about eight last night that our two were well and happy, as we had been a little concerned with Susan, who does not like to stay away from us overnight. We should see them again by four P.M. and you know all about it then. The house has been very quiet since they left and you can be sure we miss them more than they miss us. View of Half Moon Bay, 1950s. Did we tell you about Susan’s chickens? The gardener gave her a hen several weeks ago, but we kept it at a neighbor’s. (Editor’s note: My mother said she named it “Clarabelle” and that once, while cuddling it as she sat in her swing in the yard, it laid an egg – in her lap!) I finally had to build a pen and then a “friend” gave her another hen and twelve chicks. There are ten chicks left and growing like weeds. Apparently, seven of them are roosters, which is fine with me, as I like fryers, but we are having a hard time convincing Susan we should eat them in time. Maybe the others will provide us with fresh eggs in time, but it is a problem getting feed for them. Susan wants to feed them rice, cooked of course, and most of the bread, etc., left over goes to them. All we need now is a cow and another dozen hens, and we are on the farm again. . . we are getting good eggs from Australia most of the time and good frozen fryers, but the fresh ones would be well received. Susan and Judy just arrived and have tales to tell of the high wind and sand storm, the rain, and all the goods and bads of a camping trip. They seem to have enjoyed it and I think it is good for kids to do this at least once in a while. It will probably take us the rest of the afternoon to clean up the kids and the gear, shake out the bedclothes, give them all a bath, and then get a late lunch or early dinner. . .
Aramco Overseas Company, a subsidiary of the Arabian American Oil Company, is planning to establish an office in Rome, Italy, it was announced by W.F. Moore, President of Aramco. This new office will be used primarily as the European Engineering Headquarters and for recruiting Italians for employment in Saudi Arabia and for the purchasing of equipment, materials and supplies for soft currencies. It may be that we would want to go there for a year or so, if we are offered the chance, as it is only 22 hours or so from New York, and is a grand place to live we think, as climate, food, facilities, etc., are the best in the world. If proper schooling for Judy should be right handy, it would have more appeal to us than sending her to Beirut, leaving her home, staying home with her until we are ready to leave foreign work for good, or any other deal such as Mildred staying home with her and my returning to Arabia for a tour or two. This Rome office might well expand and be the main office of the company, as many qualified Italians are available for all classifications, the company wouldn’t have to provide housing, feeding, etc., as it does now in Arabia, it could pay them in soft currencies, which is very necessary more and more as we sell oil for other than dollars, and many other company expenses might be less in Italy than in the USA. We aren’t going there now, or soon, but if we don’t visit on our local leave, will plan to spend a week or so enroute home in 1951 and look the place over. . .
Rather cool week, highest temperature 92 and lowest 72. It won’t be long before it gets hot and stays hot. It was not too hot for the second annual flower show, which made many aware of the large variety of flowers grown here. Some displays were by children, and our two orphans entered exhibits. It would amaze you to see how nice of a show we did have. . . Finished my forty-first lecture Wednesday and start in the other two Camps next week. Supposed to be fifteen in Abqaiq and twenty at Ras Tanura. It gets monotonous, repeating the same thing over so many times, but it gives me a chance to meet every American employee and to explain personally the duties of my department. I’ll be glad when it is over. I hope to drive daily to Abqaiq, forty miles, give the four per day one and a half hour talks, then come back here. It may be too tiring, but will see. 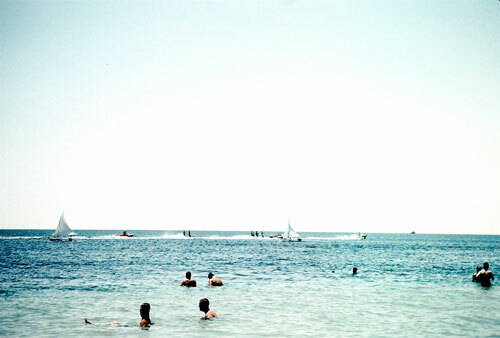 Then if Lynn will take care of the kids, Mildred will go with me to Ras Tanura, and we’ll stay there for almost a week. I’ll really be glad when it is over and I am back to my regular work again. We are, like most here, talking about a vacation, and making various plans. We haven’t ever taken a local leave, but should this year. [We are considering going to] Beirut and then [taking] a trip to Jerusalem . . . Beirut . . . Jordan . . . Dead Sea . . . Jericho . . .This all-expense tour for groups of 21 people costs 85 USA dollars. Then we thought we would go to Island of Cyprus for a few days, as it is advertised as the land of Sunshine, Romance, Archeology, Sandy Beaches, Snow, Mountains and Valleys, Streams and Waterfall, Godly Wines, and Beauth Spots. That last word is spelled correctly, but I don’t know for sure what it means. I relocated the chicken coop and cleaned up the garden spot for the summer, Mildred and Judy straightened the house, rearranged Susan’s room (a sure sign of spring) and now we are resting, while I am writing my part of the weekly letter. Blowing great guns today, so we are staying in after a quick trip to Al Khobar to try and find some buttons for a dress for Judy. Found the buttons, but wouldn’t pay $1.50 for some dime store material. Have had this wind now for several days, and with the sand in the air, is far from pleasant. Lucky for me, it was not blowing badly all week when I traveled for days to Abqaiq for the lectures and home at night. Mildred went with me one day and visited with friends there, but it was hot coming back at night and on the fourth day the temperature was 122 in shade. Here it has been up to 112, but the windy days generally keep it down. Finished my 55th lecture Wednesday and go to Ras Tanura Tuesday to give three instead of twenty. It is an experiment and if successful, will be adhered to instead of the first plan. . . [I] have enjoyed telling almost all of our 2,200 American employees the story of Motor and Marine Transportation. There are fourteen managers following me, telling of their department activity, and so far most people seem interested in knowing who does what and why. We are in the process of an old clothes drive for the Palestinian refugees, one part of the Aramco-Personnel Aid Rally. It is hoped we can collect a large amount of clothes of all kinds for the thousands of displaced persons from Palestine who are residing in Lebanon and other nearby countries. (Editor’s note: this displacement was a result of the United Nation’s Partition Vote in 1947 that ultimately created the country of Israel and led to an Arab-Israeli War of 1948-49.) Much interest is indicated and the publicity work is handled by movie, bulletin boards, mail, loudspeakers in cars, etc. One baby born this week, a boy, weighing 8 lbs.-8 oz. most of our babies here seem to me to be heavier than most at home. Maybe it is the sand. June already, how the time flies. We can remember when June meant getting ready to be able to go to Glacier National Park, and if Spring and Summer came early enough, we might make our first trip of the year in late June or early July. Now June means to us that we shall not have any more vegetables from our own garden (I dug up all the onions yesterday), that we can’t water the yard until after dark because of the hot sun, and that we must wear hats and dark glasses for four months or so, always carry [a] water jug when leaving camp with a car, and take salt tablets at least once daily. I had to being my thermometer into the house as it only went to 100, so don’t know if the outside temp is officially above 100 or not today, but it has been to 112. I mowed the lawn and worked outside until two, in the hot part of the day, and it was too hot to stay out in for long. My feet burned on the sand and concrete sidewalk. I am a tenderfoot for fair, as when in Ras Tanura last week I walked to the beach about three blocks from the apartment, and blistered both feet on the sand. That is the first time I ever did that anywhere. Yesterday was pickup day for old clothes for the Arab Relief in Palestine. Quite a large amount of clothing was collected and after being checked over and mended, will be sent by the company to Beirut. Mildred is a block captain and will head up families in this block sewing layettes for the Refugee babies. 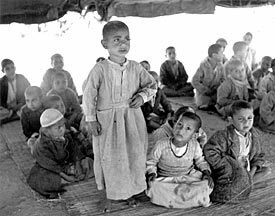 Arab refugee children, circa 1950. Photographer unknown, courtesy the Internet. One of the our engineers who visits the capital often on business told me a lot about the Kings and Princes’ palaces that may be of interest to you. As the Kings’ sons grow up, they each take their mother to live with them. In case more than one son is born to a mother, the oldest son takes the mother. This requires additional palaces, each of some 50 to 60 rooms. The King’s palace is actually a group of palaces covering many city blocks in size and containing his own power generator and air conditioning units. The rooms are huge, each being about 60’ X 80’ X 20 feet high. The Crown Prince’s present palace has only 70 to 80 rooms, but a new one is being built, Western style, with 300 rooms. He also has a garden and swimming pool some distance out from the others and will have several hundred rooms and thirty bathrooms in buildings near it. The second son, Faisal, had a palace of 300 rooms, average size [of rooms] 15’ X 25’, which is not a guesthouse. The King of Afghanistan visited the King of Arabia last Fall, and for such a new palace was built, containing more than 70 rooms. The King’s favorite sister has a palace of 500 rooms. It is reported that the Crown Prince has a modern kitchen with electric and oil stoves, refrigerators, etc. He has an American cook who serves him food cooked American style, brought from America. Most palaces have roof areas for sleeping and lounging, praying, and visiting. The new palace for the Crown Prince will be three floors and a basement, a real innovation for Arabia. the roof of the King’s palace in Riyadh. 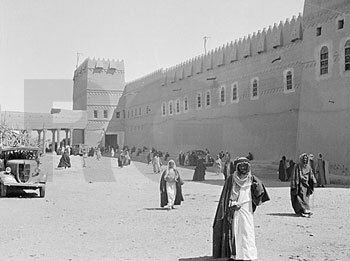 View of royal palace in Riyadh, 1937. Source: Royal Geographic Society online archives. Talk about Chamber of Commerce taking steps to attract tourists! Listen to this notice by General Commissioner of Tourism-Lebanon. “1. The General Commissariat for Tourism will pay part of the fares of any person residing in Egypt, Iraq, Saudi Arabia, Jordan, Yemen, Bahrain, Kuwait or Katar, who comes to…Lebanon between June 1st and October 31st with the purpose of spending the summer. 2. The return fares will be computed between Beirut and any of the following places: Cairo, Alexandria, Port Said, Baghdad, Jeddah, Amman, Bahrain, Sannaa, Taez, Hodeida, Kuwait, Dhahran or Katar [Qatar]. 3. The maximum return fares will be $50 for children and $90 for adults . . .” This is the first time such an attraction has come to my attention. Last week we had the pleasure of hearing Donald Dame, who is [a] soloist on well-known radio programs. (American Album of Familiar Music and the Bell Telephone Hour.) . . .He was accompanied by Miss Ditmar. This couple [is] traveling around the world, stopping at Army camps and bases, and we were offered by the local Base for our entertainment. 1950 while on a worldwide tour. The girls have kites all made for the local contest, but it is again postponed due to high winds. I used linen instead of paper and a stapler instead of flour and water paste, and fear for the success of the flying when deviating from time-honored customs and materials. Effective July First, but dating back to 1942, we have a new retirement plan which pays 50 percent more than the previous one. It costs each employee about ten percent of his wages, and pays after retirement approximately 3 percent per year of the total earnings during foreign service. It sounds good, and requires retirement at 60, which I don’t like, but won’t worry about now. Today is the first day of Rhamadhan, the month of fasting, for all good Moslems, from dawn to sunset. A fast has always been a part of religion. In Islam it falls in this month because in it the Qur’an was revealed, and it is holier than the others. It begins when the new moon is actually seen, and lasts until sight of the next new moon. It extends each day from the time when a white thread can be distinguished from a black one and until nightfall; it is absolute in that time as to food, drink, women. The sick and those on a journey may be excused, but should fast thereafter an equivalent number of days. The last ten days of the month are regarded as especially sacred: in the course of them falls the “Night of Decree,” or “of Power” (Qur’an xc. 1) but its exact date is not known. Fasting in Rhamadhan (sometimes spelled Ramadan) is reckoned one of the five pillars, or absolute requirements, of Islam. It is followed by the Lesser Festival, the first three days of the month Shawwal, Arabic-speaking Muslims (Moslems) call this latter ‘Id al-Fitr, the festival of the fast-breaking, or Al-‘id as-saghir (Lesser Festival). Ramadan is the ninth month and Shawwalk is the tenth month of the Arabic year. It is a time to pay official visits as well as private ones, some give and receive presents, new clothes are put on, and the graves of relatives are visited. The second or “Greater Festival” is called Al-id al-kabir, or ‘Id al-adha, freely translated as the “Festival of Sacrifice.” This falls on the tenth, and two or three following days, of the last month, Dhu-l-hijja, when the pilgrims each slay a ram, a he-goat, a cow or a camel in the Valley of Mina in commemoration of the ransom of Ishmael with a ram. Similarly throughout the Muslim world, all who can afford it sacrifice at this time a legal animal, and either consume the flesh themselves or give it to the poor. Otherwise, it is celebrated like the Lesser Festival, but with less ardour. Both festivals, of course, belong to a lunar calendar, and move through the solar year every 32 years. Possibly I wrote of this last year or told you of it while we were home, but repeat it here anyway. It means for our Arab employees that if they so desire, they may only work six hours a day all month, six days a week, and will get eight hours pay and seventh day pay. . . as the period is thirty days without water, food, cigarettes, etc., during the day, and as their sleep time is taken up mostly with eating and drinking, they try to sleep on the job or don’t sleep. You can well imagine the celebrating when it is over. Often they get sick when they first eat or drink. It is a time of short tempers, and we all are warned to help all we can to not irritate, etc., by eating in front of them, drinking water, smoking, etc. This period is moved forward ten days each years as their year is ten days shorter than ours. In a few years it will occur in the cool of the year for a while. New loading record at our tanker docks was made on June 12 while loading “The Texas” under the command of Captain S.C. Peterson of Port Arthur, Texas. Five hours and 40 minutes to load 204,076 gross barrels of crude oil, this being an average of 36,013 barrels per hour and for first hour the rate was over 43,000 barrels per hour. . .
On June 13th and and 15th an Air France Skymaster crashed while coming in to the landing strip at night on Bahrain Island. 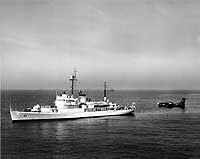 The passengers were mainly military from Saigon, Indo-China, and nineteen were saved from the total of 102 aboard. No satisfactory reason was officially given as yet for the double catastrophe, but it was a time of high wind and sand in the air. Two boys were born this past week and there are continued indications that we shall make our forecasted quote before the year is out. We are sending 50 Saudi Arabs to Beirut for summer school, as we did last year. They are from all parts of Saudi Arabia. This is all at the expense of Aramco and we are the gainers when they can do better work after the advanced schooling not otherwise attainable to most of them. If you read in the paper about a Florence Chadwick attempting to swim the English Channel, you will know that she was one of our stenos and was [the] leader in the swimming meet called “Aquacade” [Aramcocade] we wrote about two years ago. [The] Fourth of July will be a large weekend for us here as usual. The King is providing watermelons from his private garden (which we operate), and there will be dancing on July third, then all the next day a series of contests, field events, barbeque, etc., in all camps. This is one of the American holidays observed by all employees, the other two being January First and Christmas. May was the record month of all time for Aramco, as we produced an average of 550,846 barrels per calendar day. It looks like July will beat this, but that much is really lots of oil. The average for first five months of this year was 474,506, which for such a period is good. . . Among the different nationalities, etc., working here for us are the following: Saudi Arabs, Adenese, Pakistanis, Indians, Sudanese, Bahrainis, Somalis (French, British and Italian), Iraqis, Chinese, Kuwaitis, Malayans, Omanis, Persian, Syrian, Hadramoutis, Muscatis, Zansibaris, Javanese, Egyptian, Italian, Palestinian, Lebanese, Celonese, Eritreans, and maybe some I have overlooked. Have just completed a safe and sane Fourth here in Arabia and really had a nice day. . .
9:00 A.M. Tennis Tournament, and Baby Beauty Contest, and Bowling. 10:00 A.M. Teenage Field Events, which included three-legged race, back race, obstacle race, 50 yd. dash, tug-o-war; egg race; donkey races. Susan won the latter in her age group and I am sure that part of it was due to having tried out all the donkeys for an hour before, paid the Arab four riyals to hold that one for her, and it was the fastest, at least when she rode it. She can do anything with animals it seems. 10 A.M to 10 P.M. Bingo – continuous. Susan played this for several hours, in between buying ice cream cones and riding donkeys. 11:30-1:30 Much needed intermission for lunch, etc. 1:30 P.M The Dhahran Fire Dept. played a game of “Roll out the Barrel,” with fire hoses and a little red barrel. The idea was to roll it across the goal line and the two teams fought it out in wajid water. 2:00 P.M. – 3:30 P.M. Swimming events for girls and boys, no adults. Judy won one first, one second, one third and numerous places. While I think of it, she also won a prize in the morning Field events. 3:00 – 6:00 P.M. Dancing, Horseshoe Pitching, Pie-Eating Contest, Dancing, Free Beer. 6:00-8:30 P.M. Free barbecue, free beer, marvelous local watermelon from the King’s Farm, etc., visiting between tables on the patio, etc. Must have been at least 2,300 Americans there, plus all kinds of non-Americans. 8:30 P.M. Another tug-o-war and then the Donkey Polo Game. The latter was a riot. I’ll brief some of it for you, and will quote the first page of the program. Of course, you would get a bigger kick out of the game when you know the players, but apparently we have some wits with us. Donkey polo team roster for Fourth of July 1950. Ken Webster copied this roster from the printed program. Perhaps some readers will recognize the names! Courtesy Ken Slavin’s collection of Webster papers. The nicknames of the men and girls is obviously due to a physical or other appearance or characteristic, and brought forth many laughs as they came on the field . . . Both men and girls were constantly falling off the donkey, or hitting an opposing player or the donkey left the field, etc. 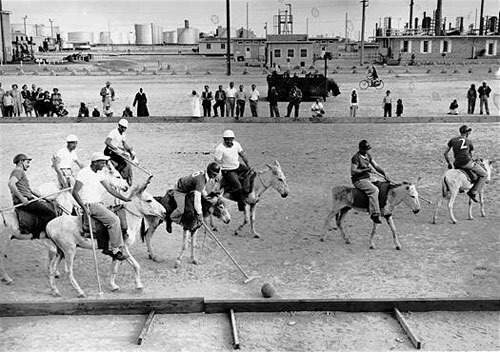 Donkey polo match, Ras Tanura, circa 1950s. Photographer unknown. Source: The Internet. Several of the “younger” set finished up the evening at the patio dancing to the Air Force Dance Band. This is an Italian band imported from Eritrea by the Army to work in the canteen and dining hall, but definitely to play for any and all occasions. We have several good orchestras of our Aramco Americans and cannot complain about the music. Normally, we use recorded radio music which is transmitted over the power lines to all three main camps for eight to twelve hours per day and the very latest music plus symphonies, etc., are played. Did I tell you that the first drive for clothing for Palestine refugees ended with a collection of 2,987 pounds of wearable clothing, much of it new, and all of it washed or cleaned and mended if necessary. It will be flown to Beirut for distribution. Women’s Club gave a tea for our president’s wife, Mrs. W.F. [Dottie] Moore, and about 350 to 400 attended. 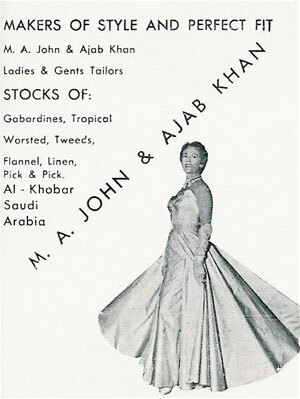 Of course, both the Arabian Webster women [Mildred and Lynn] had a hand in it. It was quite a successful affair.Today I mowed the lawn, trimmed the hedge, spread fertilizer on the lawn, filled in holes with dirt, and had my usual sunbath. It is now one thirty and with lunch over, the Friday show time soon to take the girls’ main interest. My weekly letter almost completed, Mildred and I have nothing to do except nap, take a ride, or go visit someone. Why don’t you all drop in and pay us a visit? Today may be the last day of Ramadan and if so, tomorrow will be Id El Fitr. The month of Ramadan is 29 or 30 days long, depending on the moons, and today is the 29th day of this Moslem month. If the new moon is officially seen tonight by the properly appointed representative of the King, then tomorrow is Id El Fitr and the first day of the next month, Shawwal. [If so], Moslems get tomorrow and Sunday off with pay, and non-Moslems get Sunday off with pay. The fourth day of next Moslem month (Shawwal) which will be Tuesday or Wednesday, will be a holiday for all in honor of the King, as it will be the 50th anniversary of the Capture of Riyadh, the capital of Saudi Arabia, by our King Abdul Aziz Ibn Saud in January 1902. It is 50 years by the Moslem calendar since that date. This is a special holiday this year only, and we have therefore seven official holidays this year. In 1945 we had an extra holiday to celebrate the return to this country of his majesty the King, after he conferred with Roosevelt and the King of Egypt in the Mediterranean. 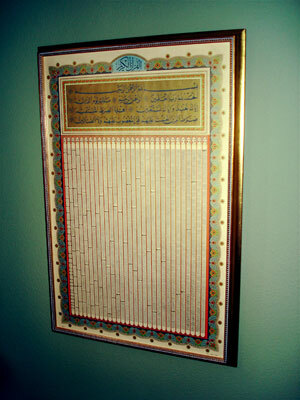 The Moslem calendar is based on a lunar year of twelve months. Since a lunar month, that is the time between two successive new moons, is about twenty-nine and a half days, the basic length of the lunar year is 354 days (12 X 29.5). However, to take care of a slight overlap, an additional day has to be added eleven times during every cycle of thirty years, so that there are eleven leap years of 355 days each to accompany nineteen normal years. Since the ordinary lunar year is eleven days shorter than the ordinary solar year, the Moslem year begins eleven days earlier each year according to the Christian (solar) calendar. The Moslem New Year’s Day progresses steadily from the end of the Christian year towards the beginning, a process that is repeated over and over again with the rolling past of the centuries. It takes roughly thirty two and a half solar years for the process to be completed once. Consequently, for the purposes of ready calculation, it may be said that one hundred years by the Moslem calendar are approximately equivalent to ninety-seven years by the Christian calendar. The year 1 of the Moslem calendar was the year in which the prophet carried out the Hegira (Hijrah) or Migration from Mecca to Medina, 622 A.D. The abbreviation A.H. for Anno Hegirae (in the year of the Hegira) is used in referring to a year of the Moslem calendar. The Saudi Government considers three occasions as official national holidays. The first of these is the Feast of the Sacrifice or the Greater Feast, of which I wrote of recently. This begins on the 10th day of the twelfth month (Dhul Hijjah) and lasts for four days. The second is the Feast of the Breaking of the Fast, or the Lesser Feast, and occurs on the first three days of Shawwal (tenth month), which may be starting tomorrow. The third is the Accession Day, we call it Coronation Day, commemorating the swearing of allegiance to the King as King of the Hijaz on January 8, 1926. Since this is a day on which the King receives congratulations from the heads of other states, it is fixed according to the Christian rather than the Moslem calendar. . .
Arab donkey races, circa late 1940s. There is a fine shamaal blowing that one can hardly stand up against – and the dust and dirt fill your eyes and ears. We just came out of the show, which was Bing Crosby in “Top O’ The Morning.” Rather good. Guess we’ll clean up and go to the Dining Hall to eat. Had a visit this week of the U.S.S. Greenwich Bay, flagship of the Middle East Forces. It is the first United States Navy Vessel to berth in the new Dammam Port, second deepwater port of Saudi Arabia, and the local government officials had a dinner and then the ship officers returned it with a dinner. Many of the sailors came ashore and visited our camp here, while their team played the local air base baseball game at our diamond. in 1950. Photographer unknown. Source: Internet. [C]rude oil production should exceed 600,000 [barrels per day] by January, and every six months we could add 100,000 barrels a day as necessary. First six months of this year we produced 88,529,593 barrels or 490,000 per day average. No babies this week, but the local Stork Club has four inmates waiting for the call. I guess we told you the laying-in house for those women from other camps is across the street from us, and we keep up with the coming events pretty well. Another week goes by at only 110 high and 88 low . . .
Mildred has had her usual crop of coffees and teas, and we went to one buffet dinner-cocktail party of about fifty couples at the Executive House in honor of new Assistant General Manager Storehouse and Assistant Manager Carl Renfer. . . Yesterday took another plane trip to [the] interior and visited Al Kharj, Ain Dilla and Khafs Daghrah, the main three farms run by Aramco for his majesty the King. 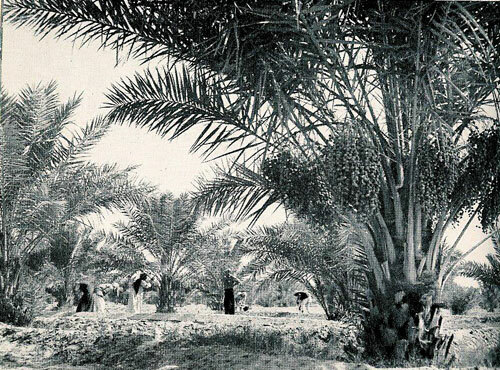 The date grove at the King’s garden at Al Kharj, circa 1950. We left our airport at eight thirty A.M. on one of our DC-3C’s (C-47) and flew at about 155 miles per hour south and west. The air miles totaled about 229, but it is over 300 by car and will be 350 by railroad when same is finished next year. Arrived Al Kharj, the main farm camp at ten our time, nine their time. After a cup of coffee, drove in Fords to Kafhs [Daghrah], about 30 miles west. It was a rough trip, temperature about 115, but low humidity, and we went by some palaces where the royal family reside[s] for a few months in the Fall and Spring. We were in fairly high hills and dropped down into the bottoms land over a rocky road hardly more than a trail. Saw several hundred brood mares, each chained by one front leg to the feeding trough, over 100 camels, and a herd of “first cousin to the Brahma” bulls, which are used as plow horses by the Arabs who work on the farm. Their hump was about eighteen inches long and twelve high, about half of the size of the India cattle. 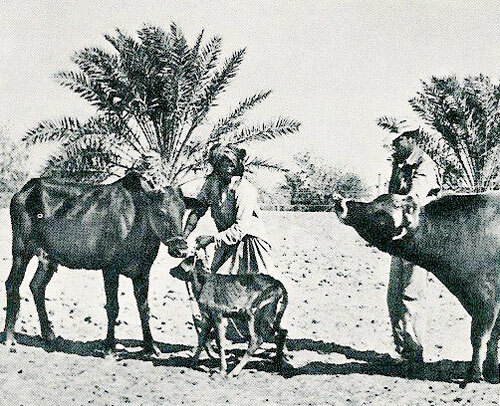 Small cattle described by Ken Webster as ““first cousin to the Brahma bulls.” He saw these at Al Kharj, one of the King’s farms run by Aramco. 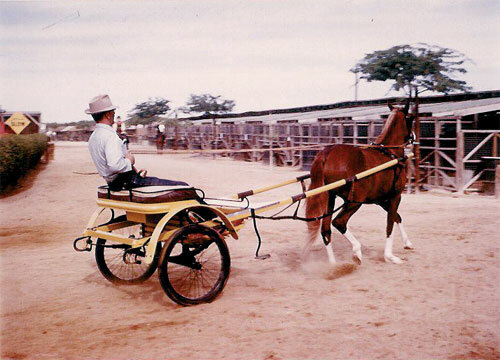 The cattle were used as plough horses. This farm is about 12,000 acres in size, uses approximately 5,000 gallons of water per minute, and is a producer of water and muskmelon, honeydew, native varieties, squash, onions, wheat, cabbage, tomatoes, etc. The well, or local AIN, is a natural sinkhole about 100 feet in diameter and unknown (at least 600 feet) in depth. . . the size of the farm is entirely dependent on the amount of water available. . .
After lunch, we inspected the camp shops, which included garage, heavy duty, machine, blacksmith, carpenter, paint, welding, etc. Many parts must be manufactured daily to maintain equipment so far from source of supply. Then we went to Ain Dilla, ten miles East and South, a farm of another 12,000 acres, which with Al Kharj [and Khafs Daghrah] of 14,000 acres, is irrigated from an AIN or well and deep well pumping equipment is used. . . Until modern pumps were installed, the natives used the water raised by lowering goatskins into it as donkey, or camels, were walked to and from the edge. One the way back, we drove through the largest date grove, and saw trees loaded with four to six large bunches of dates. Some were red, some brown, some green, some yellow. 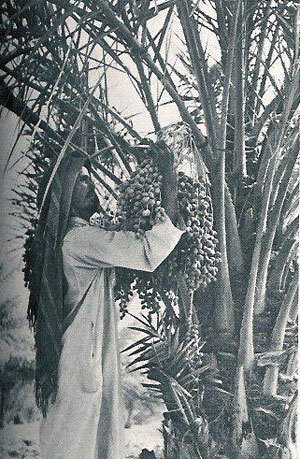 With rare exception, date trees are artificially pollinated by Arab workmen, and this year such was unusually successful, as it looks like one of the best years in past five. . . I asked the boys about quantities of produce and was told about thirteen large truck loads daily take fresh things to the King and his retinue, reported to be about 3,000 in size. Many days they get 3,000 watermelons alone. None of this is sold, but all used by the royal families, and those 17 Americans and 700 native workmen and their families. 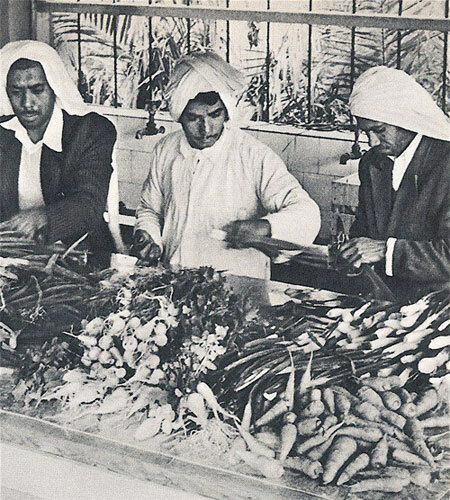 Arab workers sort vegetables grown at one of the King’s gardens, 1950s. We arrived back here about six thirty, tired, salt-encrusted (from sweat – and I don’t mean perspiration), with a good supply of produce. My share for us was two large watermelons, three each honeydew and cantaloupe, cucumbers, native melons. One watermelon is gone and the other on ice and probably will be gone before we go to bed or before I get back from work tomorrow. Judy and three other girls won their 200-yard freestyle relay last Friday in swimming meet at Abqaiq, which was won by Dhahran. Judy is becoming quite a swimmer and a lot of nice remarks are made about her style. Susan is more and more liking the water and may become more interested as time goes on. We like them to be swimmers as it is good exercise and will help them have good posture. This month is holiday for the girls, not for Mildred, who has them [the girls] all day. We hear the cry – what will I do now – but they seem to stay busy regardless.